Getting a iPhone XR screen protector is very important, you apply it to your iPhone XR’s display, and then the screen protector itself absorbs all of the damage. Some iPhone XR screen protectors can even protect your display from shattering in the event on a drop. Why use a iPhone XR screen protector? The function of a screen protector might seem obvious — to keep scratches and scuffs off of your display. Some might even keep your display from shattering, saving you from a costly expense. However, the function of a screen protectors is a little more than just keeping your device free from damages. By keeping your device free from damages, iPhone XR screen protectors actually preserver the value of the iPhone XR. That means that, in a year or two when you’re ready to replace or upgrade your iPhone XR, you retain the maximum value that it’s worth, allowing you to sell it on the top end of what iPhone XR’s are valued for at that time. You can look at a screen protector as some really cheap insurance that will allow you to sell your iPhone XR for a good amount of money at a later date. For $10 or less on a screen protector, it’s a worthwhile investment, as the dropped value of a scratched and scuffed up screen would cost you more in the long run! There are actually two types of screen protectors to consider — Tempered Glass and Regular Film. Tempered Glass is made out of a flexible and durable glass material that not only offers you protection against scratches and scuffs, but can also prevent your display from shattering in an accidental fall. Regular Film is a flexible, self-healing plastic material that also helps keep scuffs and scratches away from your iPhone XR’s display; however, they’re a little more low quality as far as screen protectors go. They don’t last nearly as long, nor do they do a great job at keeping your screen protected from shattering during an accidental drop; however, they’re generally cheaper and a significant amount can be bought in bulk on the cheap. When should you replace a screen protector? You might not be 100% sure when you should replace a screen protector. As far as tempered glass screen protectors, you’re usually good for a very long time. Tempered glass is self-healing, and stays looking like new. A tempered glass screen protector doesn’t usually need replacing until the protector itself cracks. And, generally, you don’t have to pay for a new one, as they’re often bought in bulk, and many of them have lifetime replacement warranties as well. As far as the regular film protectors go, they do need to be replaced quite often. Some of them are self-healing, but many of them scratch up easy and also tear quite frequently. These don’t always have lifetime warranties, but luckily, since you can buy in bulk, you will generally always have a replacement on hand! With that out of the way, if you follow along with us below, we’re going to show you a mix of well-rated tempered glass and regular film options. Let’s get started. Enter, Spigen, one of the premier brands in phone accessories. 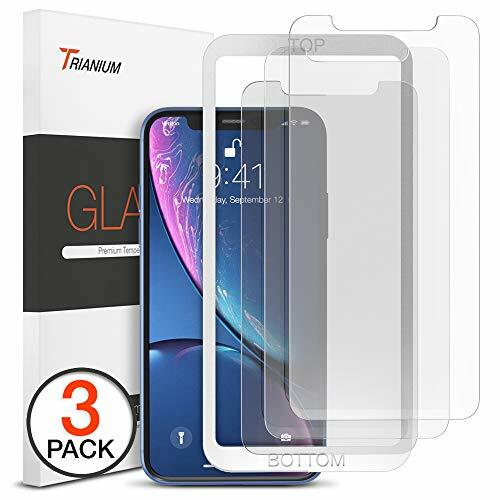 Their Tempered Glass protector is one of the best that you can buy today because of a cross between excellent durability and great value for money. 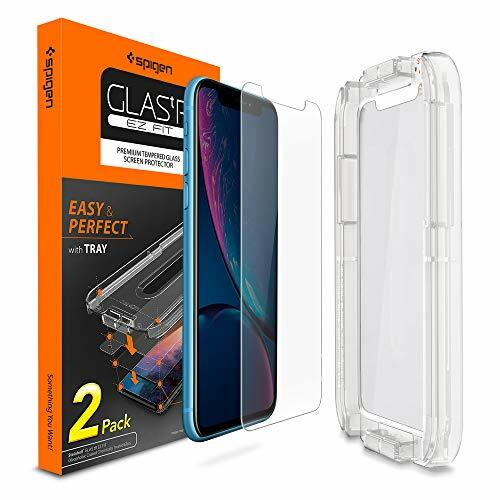 This one includes what Spigen is calling am “innovative, auto-alignment installation kit for effortless application.” You’ll apply your tempered glass protector on your own, the right way every time! The protector itself has a 9H hardness rating, so it can take quite a beating! One of the unique things about the option from Spigen is that their tempered glass protectors are made case-compatible, so you should be able to use this one with any existing phone cases you have. Spigen’s Tempered Glass Protector package gives you two iPhone XR screen protectors, and it of course, has the cut outs for the Face ID module or notch at the top. Those who are looking for value for money out of their screen protector will love what the amFilm has to offer. That’s because your purchase comes with three screen protectors. Designed for the iPhone XR, it isn’t any thicker than a couple of pieces of paper. You shouldn’t have trouble with using it with any existing phone cases. You will retain full touchscreen functionality. Abcalet has a tempered glass screen protector for the iPhone XR as well, but they take on a little bit of a different spin, giving it some privacy enhancements as well. You still got top protection with the 9H hardness rating, but like we mentioned, there are a number of privacy features inside, too. This one makes sure that your screen is only visible from a 90 degree angle, ensuring that people only in front of screen can see. That means that those looking from an angle can’t peak over and see what you’re doing! Now, this one does affect screen quality quite a bit, as there’s no 99.9% transparency rating here. You’ll still get good detail from your screen, but it won’t be nearly as clear. 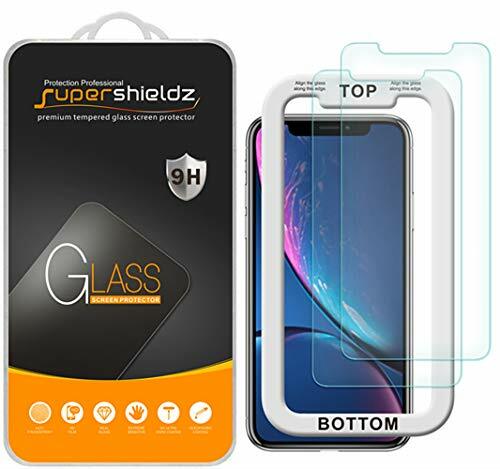 Supershieldz is another top brand when it comes to iPhone XR screen protection. It has a 9H hardness rating, providing you with top protection and performance. You can be certain that your iPhone XR will stay protected from any scratches and scuffs that you might come across. As an added bonus, Supershieldz has 2.5D rounded edges on this tempered glass protector, which keeps your fingers protected from the sharp edges that some protectors tend to feature. Supershieldz made these protectors with hydrophobic and oleo-phobic coating to protect against sweat and reduce fingerprints on the protector itself. This helps work to keep full screen clarity, on top of the 99.9% transparency rating. 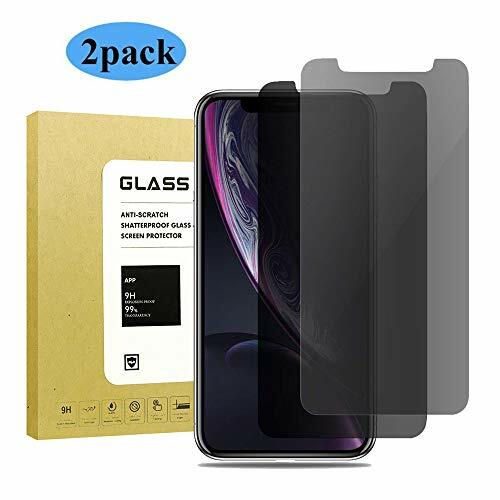 This one has excellent value for money inside, giving you two protectors inside of the package.In addition to full screen clarity, you also maintain regular function of the touchscreen. One of the nice things about this option from Supershieldz is the Lifetime Replacement warranty — run out, or have one that cracks? So long as you have your iPhone XR, Supershieldz will provide you with replacement tempered glass protectors — they’re that confident in their own product. Coming up in number one place on our countdown, we’re looking at the MaxBoost iPhone XR Tempered Glass Protector. This one comes with an easy application, coming with a plastic frame to place the tempered glass protector in the perfect position. Once you finish the application process, you’ll get the maximum protection against scratches and everyday nicks — after all, tempered glass is one of the best materials out there for absorbing damage. As we mentioned above, this tempered glass protector is actually self-healing, so over time, those scratches will disappear off of the protector as well, which preservers the life of the screen protector itself. There’s a lot of value in this package, getting you three protectors — mess up the application and you’ll have two others you can rely on. They’re great replacements when the original gets old, too. And worry not — if you are hoping that your screen protector doesn’t reduce the screen clarity of the iPhone XR’s beautiful retina display, it won’t! The protector actually has a 99.99% transparency rating, so you don’t lose the clarity at all. Trianium has a really good screen protector for the iPhone XR. Made out of tempered glass, you know that this one is to provide you with the most protection against everyday damage. Daily abuse like scratches and nicks won’t harm your screen at all — and with it being tempered glass, you can expect it to keep you free from accidental drops. When you’re ready to pull the tempered glass protector off of your phone and sell the device, your iPhone XR will look brand new, at least the display portion. And that’s great news for resale value when you’re ready to upgrade your iPhone XR! 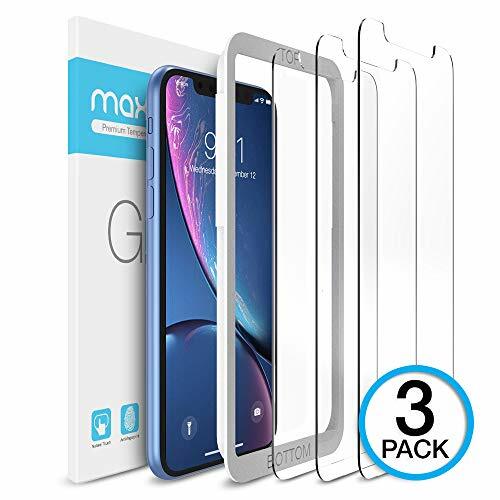 One of the highlights of this one is that the value for money is actually really good in this package, giving you four total screen protectors with your purchase. For a couple of bucks, you’ll have screen protectors for the life of your iPhone XR! 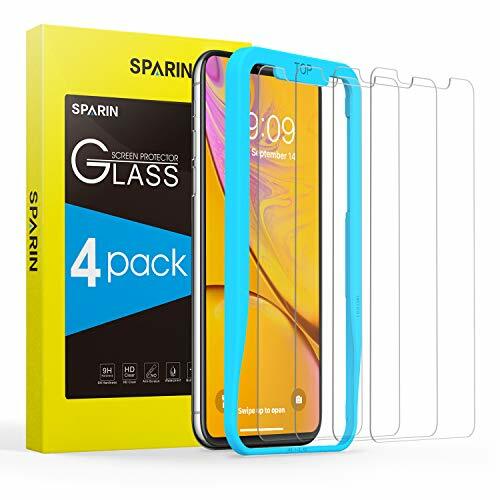 SPARIN’s iPhone XR tempered glass protectors feature an industry leading hardness rating of 9H, so you’re getting the maximum protection for your display. Like the Trianium, you don’t have to worry about the protector affecting your screen clarity either. These also have a 99.9% transparency rating, so you won’t lose any of that Retina screen clarity with this protector on. This protector is fairly slim as well, not adding too much thickness to your display. 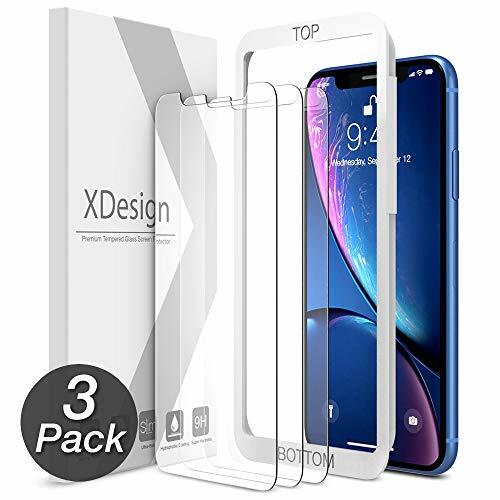 XDesign’s very own Glass Screen Protector for the iPhone XR phone is another awesome choice. You get a 9H tempered glass rating, which will keep your iPhone XR’s screen free from scratches, nicks, and everyday damage without any problems. This one makes it quite easy to apply your screen protector, as it comes with a frame so that you get the perfect application every time! With a 99.99% transparency rating, you don’t have to worry about affecting the screen clarity of the Super Retina display. MagGlass is up next on our countdown. Like many of the others on our list, this one will still offer you ample protection against scratches and every day damage — you can say goodbye to nicks and scratches forever. Daily life won’t affect your iPhone XR’s screen anymore! 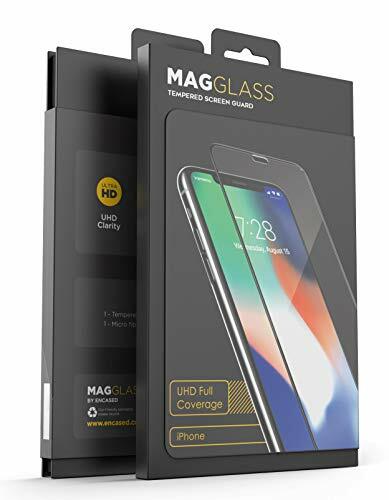 Screen clarity is a priority for MagGlass, and so, they equip with their protectors with a 99.9% transparency rating. You won’t see diminished screen clarity at all, allowing you to use your phone just like you normally would! One of the unique aspects here is the edge to edge protection — that said, your iPhone XR’s entire front body will be protected. The only downside here is that there’s just a single protector in the package. The iPhone XR might be a little less powerful than its bigger brothers, the iPhone XS and iPhone XS Max, but it’s become one of the best selling iPhone models because of its affordable price point. And you still get a gorgeous and crystal clear display on it. However, like every phone out on the market today, screens just can’t seem to take the abuse that we put them through during everyday life. They just so easily accrue scratches, scuffs, and nicks. And, you never know when that final accidental drop will happen that ends up cracking your iPhone XR’s display. Here we’ve shown you all of the best screen protectors that you can pick up for the iPhone XR smartphone. Almost all of these are tempered glass protectors, which will provide you with the best protection. 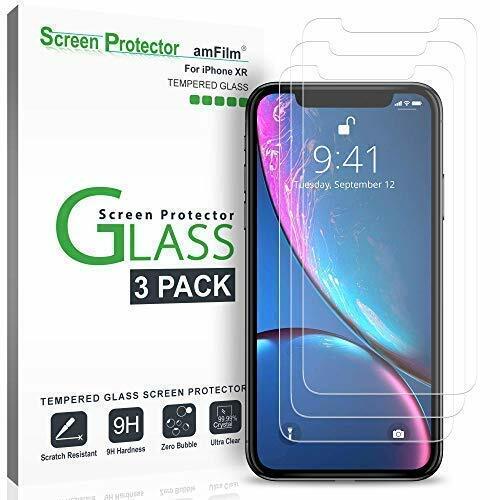 Any one of these will do an excellent job at keeping your iPhone XR’s display free from scratches and scuffs; however, the tempered glass is definitely for those that are looking for more long-term protection and little hassle. The regular film just doesn’t last nearly as long as tempered glass! Do you have a favorite screen protector for the iPhone XR? Let us know what it is in the comments section below — we’d love to hear from you, and your suggestion may even end up on our list!